Here’s another street shot of a very friendly old lady that was walking by me one day. She was walking down the street really slowly and I snapped a quick picture of her walking by, when she noticed I took her picture she gave me a big smile, so I quickly said “One more!” She gave me this big smile, I took the shot and we kept walking our own ways. I love these quick interactions with people on the streets :). 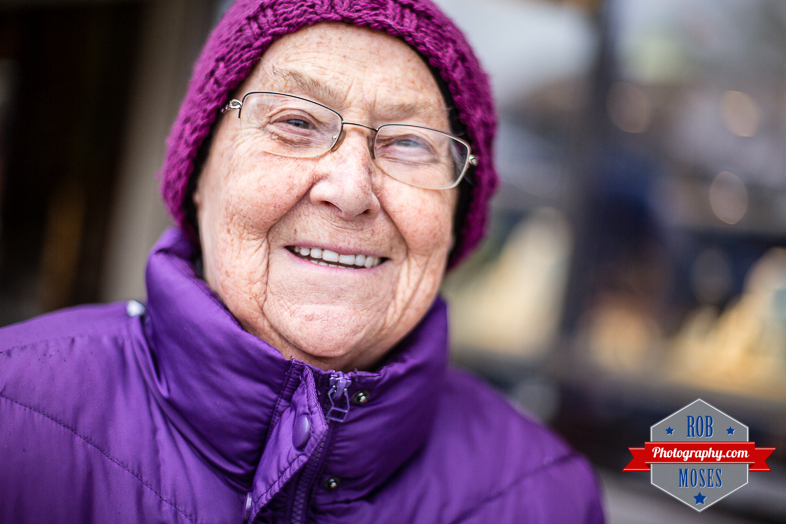 This entry was posted in People, Street Photography and tagged 50mm, 5D mark iii, 5D3, 5Diii, Alberta, beautiful, blur, Bokeh, Canada, canadian, Canon, friendly, glasses, happy, lady, old, photo, Photography, prime, purple, senior, smile, street, street photography, winter, wise, woman. Bookmark the permalink. Nice shot Rob. Great smile! Part of the great joy of street shooting – these few second, positive interactions. This made me smile. Great shot of a sweet lady! Thank you, this picture makes me smile too! She is a sweet lady indeed :). Aw! Age = beauty, for sure! Inside and out! She does look happy! Great shot!